Tucson, AZ, WPH Press, 1/128/19- Killian Carroll remained the R48 #1 following his first R48 victory of the season at the R48 Red Death ’19, increasing his rankings lead on his closest R48 pursuers Sean Lenning, Daniel Cordova, and Luis Cordova. Carroll’s next scheduled R48 start is the R48 8 San Francisco March 29-31, while Lenning will be action at the R48LTE Tucson March 8-10 and the Flying Cordovas will take on the R48LTE Mardi Gras February 15-17. 44-year old Marcos Chavez climbed into the R48 Elite 8 for the first time in his career with an impressive 9th place finish in Montana, climbing over LAAC teammate and protégé Mando Ortiz for the coveted eighth spot. 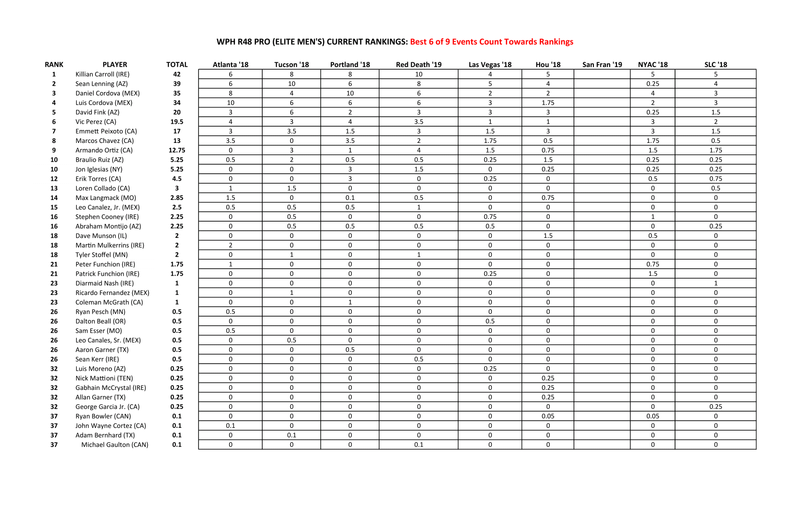 Check out all of the updated R48 Men’s Pro rankings below.